The most important of the crokinole accessories is obviously the playing pieces. Regardless of what you call them, from time to time you need to replace them. And it can be nice to play with some different colors. We have: Black, Red, Natural, White, Green, Orange, Pink, Blue, Grey, Turquoise, Yellow and Purple. The Crokinole Game Boards Cap is sure to permiate the mental side of your crokinole skill set. The longer you wear this cap, the more your 'Crokinole IQ' will grow (results may vary). This hat comes with a full back so if you happen to be bald like Jeremy, there's no need to worry about funny tan lines. What better way is there to express your appreciation for your wife who is totally supportive of your crokinole passtime, err, I mean career? This beauty of a shirt (I mean deep expression of love and devotion) is available in L, XL and XXL. 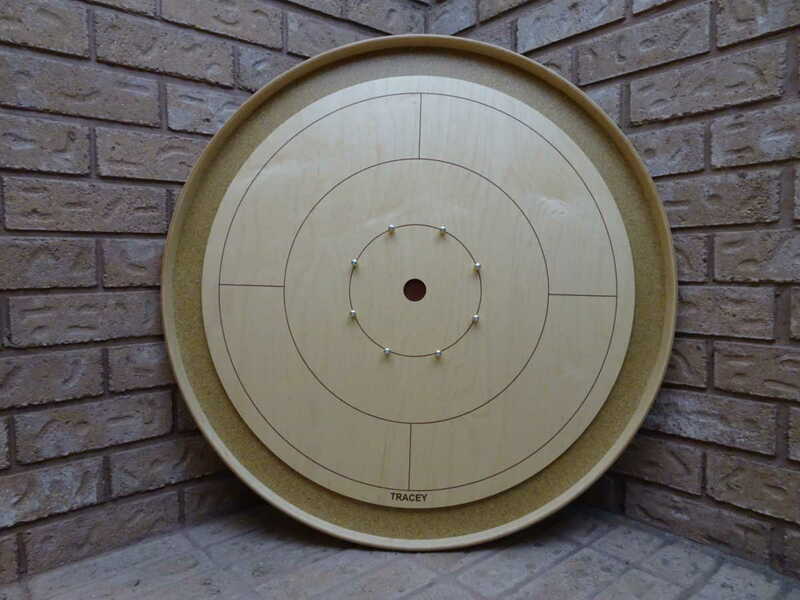 Playing crokinole using a cue is a lot of fun and much easier on the fingernails If you are looking for top quality crokinole cues, you have come to the right place.